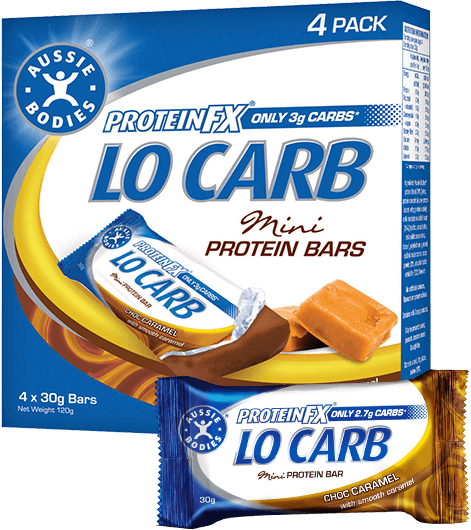 Protein Fx Lo Carb are the original protein bars to support our active lifestyle. With a soft protein infused centre, no-added-sugar chocolate coating and from as little as 108 calories, they are the ultimate guilt free snack. Ingredients: Aussie Bodies®protein blend (29%) [whey protein concentrate, whey protein isolate, soy protein isolate, soy protein crisps (soy protein isolate, tapioca starch, salt, emulsifier (soy lecithin)], protein milk chocolate (22%) [maltitol, cocoa butter, milk solids, cocoa liquor, soy protein isolate, emulsifier (soy lecithin), flavour], polydextrose, glycerol, maltitol, caramel (5%) [glucose, sweetened condensed milk (milk, sugar, lactose), vegetable fat, unsalted butter, salt, emulsifier (471)], resistant starch (starch, maltodextrin), cocoa powder, unsalted butter, emulsifier (soy lecithin), flavours.